Montgomery County Councilmember Hans Riemer has used the concept of open data ostensibly to promote transparency in government - but more often has used it to promote himself in the local media. 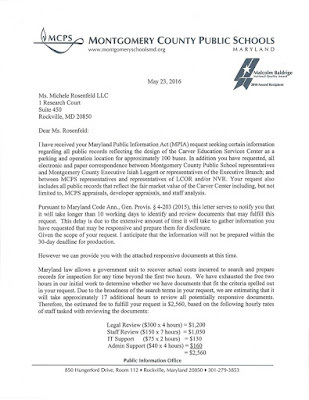 Rockville residents seeking answers about why their quiet residential neighborhoods have been selected to receive Montgomery County Public School bus depots are now finding government isn't quite as open as Mr. Riemer boasted. In December 2014, Riemer touted the County's "new policy of sharing valuable data openly with the public. The new law is a foundation for a new digital strategy for Montgomery County, which I have helped formulate with County Executive Ike Leggett and his superb team." Was government information open to the public in May 2016? Only if you have $4892 burning a hole in your pocket. 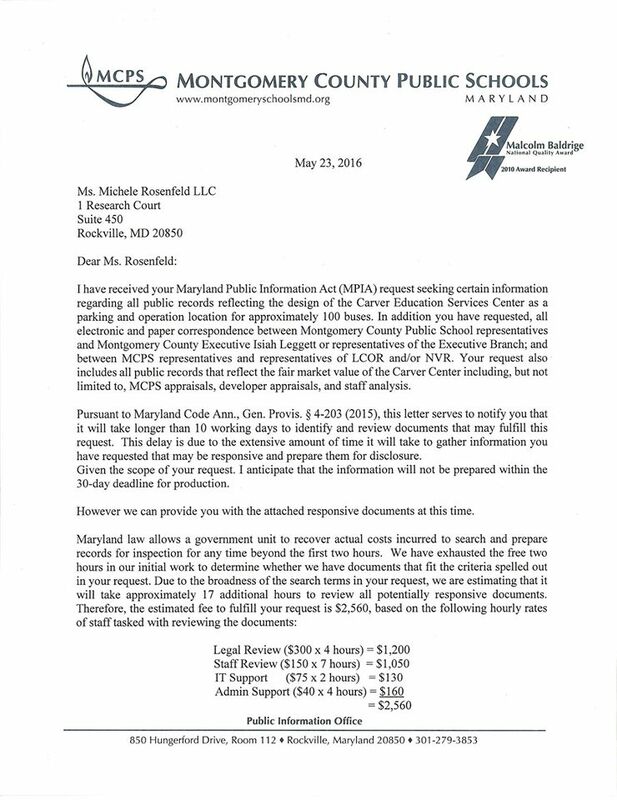 Land-use attorney Michele Rosenfeld made Maryland Public Information Act requests of MCPS and the Montgomery County Department of General Services for all public records relating to the designation of the Carver Educational Services Center parking lot as a bus depot. 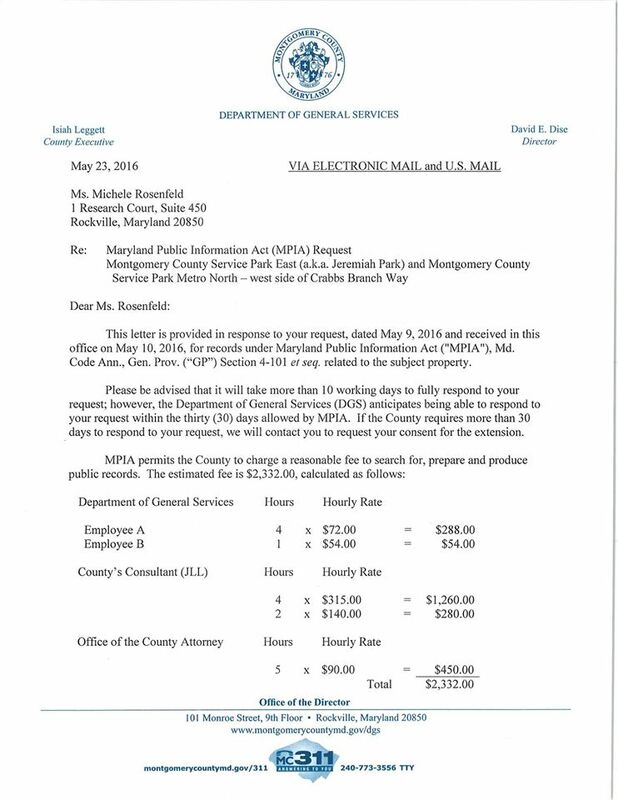 On May 23, the DGS informed Rosenfeld that her request would cost $2332 to process. The same day, MCPS told her their charge would be $2560. Even the Mayor and Council of Rockville have been stonewalled by the County and MCPS in seeking information about the bus depot fiasco. In fact, representatives from both declined to show up at a Mayor and Council meeting where the topic was discussed. How many County government officials does it take to screw in a lightbulb - or, in this case, comply with an MPIA request? At least 8, with at least four apiece from DGS and MCPS, according to the letters. 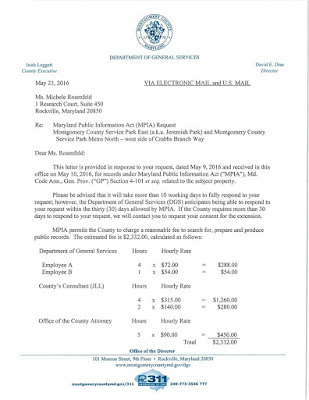 County officials either have to grant a public interest waiver - entirely justified under the circumstances, or someone has to come up with $4892 to find out what secret process led to the Montgomery County Council voting in February to fund design and construction of a school bus depot at Carver. Of course, the Council now claims with a straight face that they did not read the resolution before voting for it (the only other alternative being that they did read it, and are lying to their consituents - neither answer is a good one, folks). On his campaign website, Hans Riemer says, "Montgomery County’s government is YOUR government. You live here. You pay our taxes. You pay the salaries of each and every public employee, including me. You have a right to know what your government is doing. And I have made protecting that right a central part of my work." In reality? Not so much. Should you have to pay again, to buy the "right to know what your government is doing?" Total nonsense -- this is in the public interest for sure. Not sure why you're singling out Riemer for it though. 8:20: As I alluded to in the article, Riemer actually singled himself out by grandstanding in the local media on the issue of open data/open government. Much like his failures on the "nighttime economy" initiative, liquor reform, cybersecurity and food trucks, his showboating on each means he also gets the lion's share of the blame when they all flop.